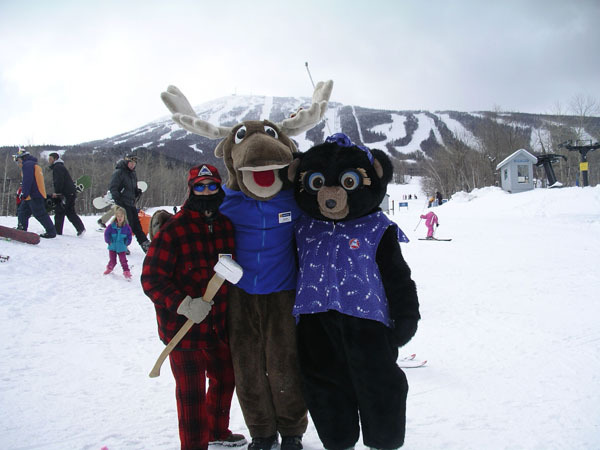 The latest and greatest on mountain events, deals and ski conditions throughout New England and beyond. It's school vacation week, a time when many families hit the slopes. So here are my tips as a former ski instructor, current ski journalist, and a skiing mom of two, for introducing the sport you love to your little loved one. 1. The magic age for starting your child skiing or snowboarding isn�t magic. It requires good judgment versus overzealous ski parenting. Every kid is different; some 3-year olds are active, adventuresome, and ready to get on snow at 4 or 6-years old. You know your children best -- if they like to play in the snow, have balance and coordination, then these are signs they are ready to ski. 2. Your child should be excited about skiing � eager to give it a try. Parents can spark interest with fun photos, ski videos, and children�s books on skiing. But don�t push it until they show enthusiasm. 3. I recommend getting your child on skis inside on a carpeted area before you hit the slippery cold snowy slopes. An inside downhill dress rehearsal is ideal, having acquired skis and boots in advance at your local ski shop, ski swap or hand me downs. Let your little skier try out the gear in the comfort of your home. As they clomp around in ski boots in a playroom or carpeted basement, and even click into their skis and waddle around, they will get the feel for the equipment. This is a great step to making the first day less intimidating. 4. If you�re a do-it-yourselfer, pick a nice sunny soft snow day to take your child for a few gentle runs on the baby slope. Use a harness, or snowplow next to them (use a ski pole - giving your child the handle end and holding it across both of you). Keep the experience happy, safe, and positive. Take photos. 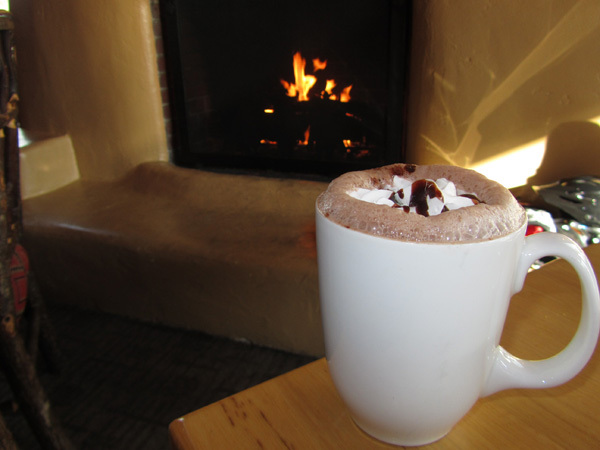 As soon as the child�s interest wanes, break for hot cocoa. One ski run is better than none. 5. Don�t think that you�re not a good parent for not teaching them yourself � the opposite can be true. 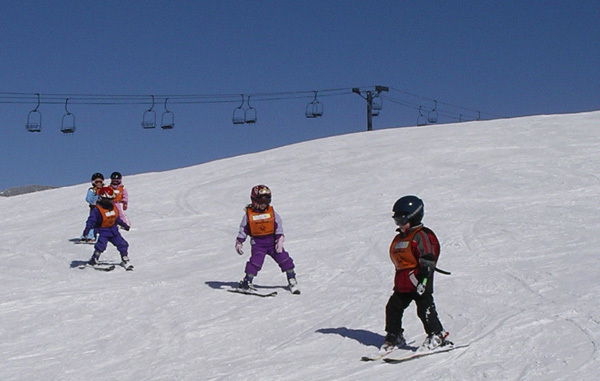 Kids� ski lessons and camps provide a well-choreographed learning environment. Instructors are experienced using specially designed terrain, often with colorful cutouts and mascots, and your children are with other kids their age and ability as motivation. 6. Call the ski area in advance or go online to get the scoop on how to learn to ski and snowboard. Reserve space and confirm what�s included (i.e. : lunch, equipment), what you need to pack, drop off and pick up times, and costs for hourly, half-day and full-day programs. Ask for forms in advance to expedite registration. 7. Inquire about deals on ski resort lodging that may include free or discounted ski tickets and lessons for kids. Avoid peak holidays and school vacations for the best prices and smallest crowds. Also, think small, you don�t need a big ski resort with huge vertical for your child�s first foray into skiing. Save time and money by going local to start. 8. 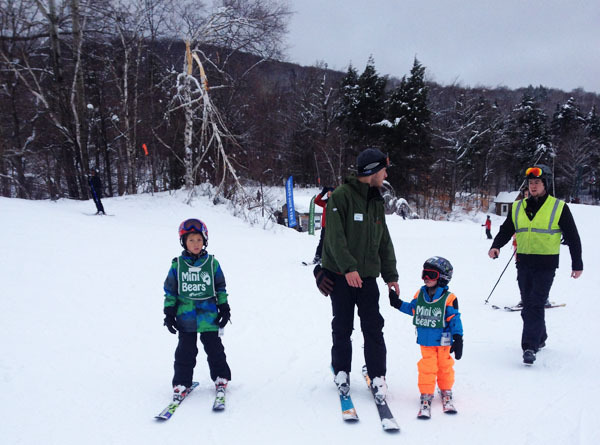 Prep your child in advance for his ski lesson with a description of his snow day. Tell him Mom and Dad are going to bring him to camp, leaving him with an instructor and other kids who are also learning to ski for the first time. Tell him about snacks, lunch, and what time he will see you at the end of the lesson � no surprises. Pack his gear, label everything, and include a favorite snack or toy. 9. Take ski pictures of your child�s first big day on the slopes. Ski pics are great later to amp up your new skier for her next ski adventure, and you are building her alpine archive in case she becomes a famous skier. However, do NOT disrupt her lesson. Watch from away, unobserved. Parents can unwittingly upset the progress by popping up in their kid�s ski lesson space. 10. Teach your kids the joy of apr�s ski. That doesn't mean taking them to a loud bar with sticky beer on the floor and drunks dancing in ski boots. I am recommending cocoa, s�mores, a swim in a heated pool (or a bubble bath), followed by family ski stories by a fireplace as the perfect end to your child�s ski day. Do this and there's a good chance they will want to repeat the experience.